Ya saben donde esta en español. just found the others on the "adult comix"..
EN DONDE PUEDO ENCONTRAR EL COMIC COMPLETO PAPU!!!!!! Lo necesito para..... ahem..... referencia. Es para una tarea! I love this kind of embrace. The cola bit was amusing. Gets faved! Sadly, ya can't go beyond this. Anymore comics with Goo Gaa in the near future? 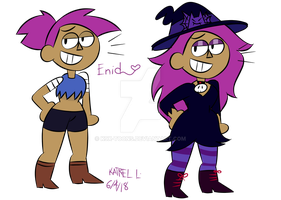 Enid is still extremely cute. Come along, hear the song, FEEL THE FIZZ OF GARA COLA!! Shesh! Page 6 to 15! What did you make them do sir Garabatoz? I wonder which way this story is going. I bet they’re gonna play PG rated games!